Have you ever been walking barefoot in your home and felt that nasty crunch in between your toes? Yuck! Millipedes are a common problem in the Minneapolis, MN area. Often times they look for shelter during the winter months or after a heavy rainfall. This means that during those times you may find these critters in your home! Gross! They may be neat little creatures to look at but you certainly don’t want them in your house! If you need to eliminate nuisance bugs like millipedes, it may be time to call a professional bug exterminator. For millipede control in Minneapolis, MN, your best solution is calling Eco Tech! Eco Tech has been serving the Minneapolis, MN area for pest control solutions for over 15 years! We are local and knowledgeable on all different pests. We have the means to eliminate nuisance bugs and help prevent them from ever coming back! We feature both all natural and traditional methods for our pest control solutions. 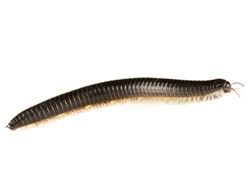 Millipedes tend to find refuge in moist, dark and damp areas like basements. While they are not poisonous and can generally cause no real harm but they are incredibly hard to get rid of! At Eco Tech, we have professional bug exterminators that offer millipede control and other pest control solutions. Most people don’t realize that millipedes aren’t even insects. Therefore, insecticides that you buy at your local home department have no effect on gaining millipede control. Let our professional bug exterminators take care of this job for you and eliminate nuisance bugs and millipedes! We are specifically trained to deal with millipede infestations here at Eco Tech. We have highly effective and earth friendly pest control solutions that get the job done right the first time! We protect our clients by using less toxic, organic products to eliminate nuisance bugs and keep your family, children, and pets safe in the process. So if you live in Minneapolis, MN and are in need of millipede control, call the professional bug exterminator, Eco Tech, at (763) 785-1414 today.